Eyes all over the world, from government, Crown corporations, industry, small business, the blogosphere, and academia, have followed our series about the now-admitted failure of Winnipeg's bike lane/path/trail/bikeway expansion (hey, whatever happened to that term "boulevard"?). The voices of the people of Downtown, Fort Rouge, St James, the west end, Lord Roberts and Robertson neighborhood in the north end, have been heard -- finally --by politicians, mainstream media, and the other residents in this election year. Today, at 4 PM; the finger-pointing starts between Mayor Katz and councillors; the blueprint for the bike lobby was printed in Vancouver- and we have the details; we'll have more about a brewing NDP election financing scandal that was first heard about on our show Wednesday; and one of the Mayoral candidates, Brad Gross, will call in and explain his platform at 4.40 PM. And Mazel Tov to our friends from Teambuy.ca, who did what we didn't in 2007 (with our Power Pro Wrestling TV project); they scored a deal with the Dragons' Den last night on CBC. We'll be talking with them about it next Thursday on TGCTS. The Free Press has reported on comments made by Mayor Sam Katz yesterday, as he moved to put a freeeze on the McDermot Bikeway. "... the Bannatyne-McDermot project has now been shelved, leading Katz to criticize city staff about the project for the fourth time in six days. "This city does not have to go the extra mile. It has to go the extra 10 miles in consultation," Katz told reporters after a mayoral-candidate forum at the Fort Garry Hotel. "When anything like this happens in the future, you will see consultation above and beyond." Katz told reporters he did not personally vote in favour of the projects, which he said were approved by community committees. In fact, the mayor and 12 out of 15 councillors approved the active-transportation upgrade on Dec. 15, 2009, when council approved the 2010 capital budget. And the project details merely came before community committees as information. Only the capital budget provides authority for the spending. In a scrum with reporters, Katz accepted responsibility. "I am the mayor. No matter where you draw the line, the buck ends up at my table," he said. Left unanswered by the mainstream media, is why did Katz suddenly wake up on the eve of construction to the issues with the McDermot project, and why did he act on this project and not on Assiniboine, Sherbrook or Berry St., when the public and area business pleas for consultation were ignored by former CAO Glen Laubenstein and his minions for months? The answer lies in the old adage, and a foundation for the work of the alternative media, "everybody knows something". And the process took less than 96 hours. 1) A listener sent TGCTS an email last week. Can you handle 'another' AT project that has slipped under the radar? It's ... it's the " Bannatyne- Mcdermot Bike Boulevard" ! This is not shown on the City's web site but a consultant says "it will be put up right away." "Consultations" took place last year. Never heard about this one, how about you? Not shown?? I know about it but all it is, is paint on the road. What were you told they are doing? Well, it seems that it may get the full treatment of "traffic calming" and that might mean "traffic circles, raised intersections, median refuge, close median or even flip stop signs " whatever the hell that all means. I was told this by a provincial rep who passed it all onto Stantec and their consultants for the City. Eh? So the consultant kept his word and the 'plan' is now online. You're right, it's mostly paint on the road stuff but they did eliminate a two-way street, Mcdermot, from Rory to Waterfront , and will make it one-way going East. Just like Assiniboine I wouldn't doubt that this thing will also be 'tweaked' with on road parking platforms and whatever else they can dream up. 2) Presented with two suspicious circumstances, being A) the absence of the project from the city website and B) the unheard-of plan to change the stretch from Waterfront Drive to a one-way westbound, I got to thinking. What was the city defence to the South Broadway Stakeholders lawsuit? "The need to consult occurs when a street is closed, but the city is not closing a street. Assiniboine Avenue had motor-vehicle and bicycle traffic and it will continue to do so,"
I am really asking this of Sam in 2 respects, both as Mayor and as Goldeyes owner. Was Sam aware that as part of the city AT designs, that McDermot, from Rory to Waterfront, is being coverted to a one-way going East? I would also like to find out from you what process the city must follow in terms of public consultations with area businesses and stakeholders to effect this change, and what stage this is at. "During projects such as this, sometimes dialogue with the community results in improvements to the project through design change," city spokesman Steve West said in a statement. "With regard to the McDermot Bikeway, we have concluded that more dialogue will be beneficial." Apparently when it comes to Berry, Sherbrook and Assiniboine, the city "concluded that more dialogue would (not) be beneficial". we'll have the chance to ask Sam the politician about why Sam the businessman gets his concerns about bike lanes affecting his enterprise heeded almost instantly, while the businesses, daycares, and emergency social services of Assiniboine Avenue were ignored and forced to file suit against Sam's government. And of course we'll ask other questions about taxation, crime, and your questions when we host Mayor Sam Katz, LIVE MONDAY AT 4PM on 92.9 Kick-FM. Yesterday, city hall scrambled to contain the political fallout after being caught lying to the residents of Berry Street, and specifically to Colin and Patricia Knight, a retired couple who are devoted residents of their St.James neighborhood. Denial after denial flew from the various players in the AT game to Councillor Scott Fielding, among others, that ANY trees were going to be removed to build the unwanted bikepath. But since Fielding had said he would kaibosh the project if any streetlights were moved, the boulevard lanes had been designed to veer away from the metal poles and towards the homes on Berry, rather then be built parallel to the roadway as 'artists conceptions' in the official mailings to residents had portrayed. At one spot on the west side of Berry, the pavement will be right beside a tree, ignoring city forestry rules that a meter of clearance around trees is required. A few homes to the south, tell-tale pre-construction purple paint outlining the lanes clearly include the tree in front of the Knights' home. Yesterday, late in the afternoon, MMM Consulting showed up, measuring and pacing off the area, re-assuring the Knights their tree was never, eeeeever, intended for removal. The red ribbon placed on it last week was just a marker so they "could find the tree later". Presumably, as Patricia suggested, writing down the address of the house the tree was in front of, isn't in the professional consultants handbook. It was 18 hours before the construction crews were going to start ripping up the boulevard grass - well, the grass still left after a summer of watermain installations - and the blueprint was still not finalized. The Knights fought for 3 years to have that tree planted and then nurtured it for the last 4. The tree is important to the Knights and the neighbours. When they saw the purple paint surround their tree after the red ribbon was tied around it, they knew they had been being lied to, and did something about it. As we interviewed Colin and Patricia Knight, a call came into Colin's cellphone. It was Mayor Sam Katz, wanting to talk. "Public Consultation" came very very late to the residents of Berry Street. And the TV cameras are out in force today to hear them complain about it. It took a long time for anybody to admit consultation on the bike paths was a failure. That it was inept. That it wasn't good enough. There's two people to point the finger to. Kevin Nixon, Active Transportation Co-ordinator. Bill Woroby, engineer at Public Works. Fed-up Residents ask: Are trees being chopped down for the Berry Street Bike path? The alternative media influence in this city and on the civic election is being recognized by MSM. Two weeks after we showcased blogger Brian Kelcey and pointed to the criticism leveled by Policy Frog, the two former city hall insiders were quizzed in todays Free Press about their opinions. In fact, Froggies attack of not only the consultation process but the safety elements of the bike lane designs is believed to have been a turning point in the credibility of the stories our listeners have brought forward. Graham Hnatiuk, whose attempt to alert the city auditor about the planned waste of taxpayers' dollars and dangerous conditions created in South Broadway was diverted to Assiniboine bike path honcho Kevin Nixon, furthered his coverage with pictures of a tour bus coming from the legislature, that was stranded on the new extended raised curbs at Kennedy St.
Another bus got stuck last Friday; we have reported that police were never consulted about how street direction changes could affect 911 response; and seniors on Edmonton St. are trapped in their homes by the high curbs and canceled transit route. This weekend, Cherenkov discovered that the bike path on Archibald doubled as the sidewalk for Windsor Parks' second busiest bus stop at Elizabeth going south. Not only are pedestrians being endangered by design, but so are the cyclists. The 2.4 meter path is almost bisected by a giant thick metal pole. Why, you ask? Well, to support the red light camera that produces the fewest tickets in the fleet, as in 1 per week. Still, as revenue trumps all, cyclists will be squeezed between the pole and the fence of the St. Boniface Golf Club. All of these examples, brought to light by the work of the alternative media, demonstrate that there are many serious implications to altering our urban terrain, including the safety of pedestrians, the disabled, seniors -- many of the 3 aforementioned are also high-rise dwellers (another endangered group), and of course now we see, of the cyclists themselves. Plus adding to air pollution, gridlock, added business costs, and the admission by Coun. Gerbasi she'd be happy to spend money next year to fix the mistakes but let's build it wrong first. It is like the city planners, coordinators, consultants and politicians, cannot see the forest for the trees. Speaking of trees, the residents of Berry Street have had a fire lit under them after the purple paint on their boulevard, outlining the bike paths on the Portage to Ness stretch, included a couple of trees that logically would be chopped down and paved over. The city has issued repeated denials today from the forestry office, bike lane czar Nixon, Marr Consulting, and the project engineer, that ANY trees are going to be removed. The residents don''t buy it. The people of Berry fought to plant trees and cared for them. They see the paint surrounding the trees. Grass is being paved over for a bike lane. A bike lane that they never asked for and that has changed shape and design is being forced on them. They do not trust the officials or Councillor Scott Fielding. The original letter in August was vague on the fate of the trees, and showed 2 straight pathways parallel to the road. 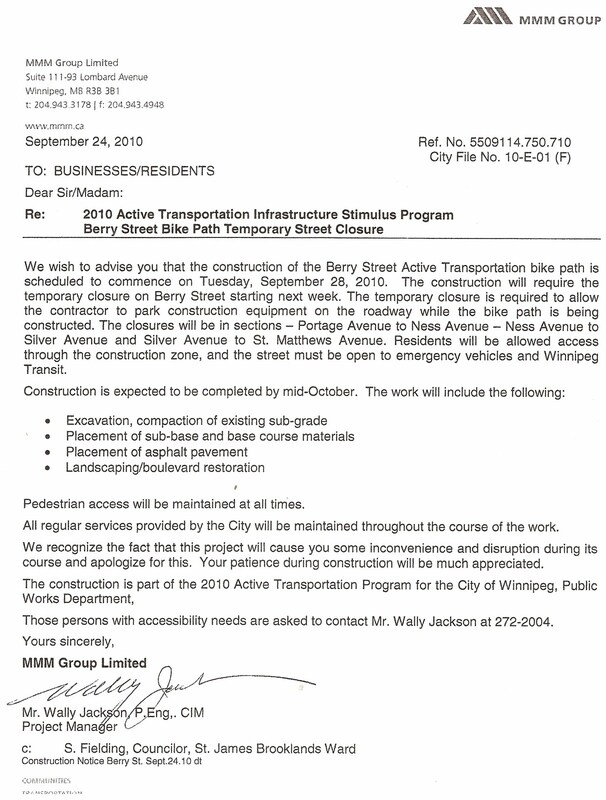 The second letter, dated Sept. 24th, gave them 4 days notice of their street being closed and torn up for the bike lane construction, says nothing about trees being lost or not, and does not have a pretty picture of the bike lanes so clean and straight, as the revised design would have to show a curving path that goes over manholes, across car driveways and right-of-way sidewalks to the roadside, and is forced to veer a specific distance away from light standards - and at one point on the west side of Berry, curves to run right beside the sidewalk directly in front of the gate of one homeowner. No wonder no one has ever seen a rendering of the final design. The working class and retired homeowners of Berry Street have waited in vain for sidewalks to be repaired and replaced - let alone made level. After being embarassed after learning that the boulevard water mains would break and require the bike lane be dug up, the city hurriedly tore up the water lines, leaving behind a half-block long patchwork of mudholes and mini-swamps on both sides of the street. The residents see busted sidewalks, mud-pitted boulevards, and trees being outlined for demolition in front of their homes --- all for an unknown number of commuter cyclists to ride through in front of their doors. I arrived at the Fort Rouge Yards Project open house at the Lord Roberts School on Beresford at about 5:15p.m., there was already quite a few people in attendance even though the event didn't officially start until 5:30. According to Adam Dooley of Dooley Communications the final tally in attendance was 120. This is the final public consultation being put on by the developer Lexington Development Corporation, there had been three other consultations though only the one held on July 29th was open to the public. The rest had been by invitation only. There have been changes made stemming from the feedback at the July open house. * Lexington Development also plans to create a $500 000.00 development fund for neighbourhood improvements such as parks, gardens and schools as well as community centres. - Lexington has scaled back the plans to two buildings capped at 21 storeys, these buildings will be kept back from the street in the far southwest corner of the development project. Reader boards detailed the shadows which would be cast. Smaller buildings will be used instead, including at least two that are between 8 and 10 storeys. - Lexington has added parking for their development and assures residents parking will be permitted on City streets, however a soccer pitch is next to Argue and people are concerned that there will not be enough parking in the area to be able to handle additional vehicles on game days which will force parking to be moved to the surrounding streets. Traffic engineers from Dillon Consulting indicated there wouldn't be a large number of vehicles for those events as most people live in the community, however no numbers were available to substantiate those claims. According to William Kavanagh of Dillon Consulting 115 new parking spots will be added. - Plans for Argue could include traffic circles as well as on-street parking, however there are no current plans to extend Argue as a through street to Jubilee, or south to Brandon and Morley. This is an issue which was raised by one area resident Raymond Bow who lives on Walker. According to Raymond there are now tractor/trailer units travelling down Walker which is not listed as truck route and he fears that without a through street from Argue not only will this continue, but will worsen as vehicles attempt to get to the Safeway. Raymond did say he is "worried about significant increases to traffic with these plans" and wants a through street from Argue to Morley where lights are located. Raymond also indicated that he "doesn't mind the project" except for traffic and sewer issues. Raymond further went on to say he "doesn't believe the city" and he "doesn't believe a word Gerbasi says". One lady who lives on Jubilee stated she has lived there for 30 years and that traffic keeps increasing and while she wants more people in the area, a big concern is to fix the roads so they can handle the traffic flow. - Area Councillor Jenny Gerbasi was in attendance at this event, when asked about a comment made a Winnipeg Free Press article by Jen Skerritt as to whether or not Gerbasi supports this project, Gerbasi indicated that because this will have to go before a committee she sits on she "doesn't want to bias herself" prior to the application being made and presented to any committees and she is "trying to keep an open mind". - There is mixed community reaction to this project, some residents really don't like the plans while others think it's a good idea and those who are on the fence. Some feel there are not enough apartments for seniors and that the price which would range about $900.00 per month for a small space is simply wrong and that there is a strong elderly contingent in this neighbourhood. One resident said this is "working class neighbourhood" and that the development may not fit the neighbourhood. Parking and traffic issues also caused some heated debates, some residents didn't seem to believe what they were being told that parking and traffic would not be an issue. Other residents simply don't want the development, instead desiring a park and more greenspace. - Some attendees did feel as though this were a "sales pitch" and that it was already a "done deal" no matter what their concerns may have been and that they have not received any "straight answers". - There was one resident who is an architect who brought up the point that the BRT station is being built in the wrong location, instead of it's current placement which would be on the east end of the development closer to Osborne, it should be moved to the west corner as it would be a better placement to Jubilee. This gentleman also expressed concern that there was no park and ride facilities. Instead there are "kiss and ride" areas. These areas are meant for someone to be dropped off only, no parking allowed. This is a City issue not one for Lexington Development. Many residents like the idea of bringing in more people. Project consultant Adam Dooley lives in the area and informed me that Lord Roberts School lost their full time librarian due to the drop in enrollment. He would be glad to see more families come into the neighbourhood. Plans have not been submitted to City Hall and likely will not be finalized until the new year. Future notifications to invite the public to attend any City committee meetings will be posted in the newspapers or by checking the City website City Clerks department for schedules and agendas (who reads those?- ed.). Information can also be found on a website from Lexington Development www.fortrougeyards.com. I said in July and I'll say it again, I don't live in the area, I don't know the dynamics of this neighbourhood so I don't know if this is a good plan or not. I think parts of these plans have merit. Certainly bringing in more people could be a good thing for the schools, definitely the loss of a full time librarian at the school hurts the community though I'm partial to books. I have heard many voices both pro and con. Certainly not all people are going to like the plan and not all are going to hate the plan. Somewhere there are compromises. But there are issues, real and valid issues. Such as parking and traffic. There will be extra vehicles traveling the area. Not only from residents, but their visitors as well. Not to mention all the additional services such as couriers etc., so the residents do have a point. For the consultants to say that the soccer pitch which will be used for other purposes as well that there won't be parking problems is a little naive in my opinion. I've seen from first hand experience how many cars end up being parked for those games. Those side streets are already heavily utilized for parking. Argue has been the bone of contention in that neighbourhood for a while now. Perhaps the City should look at opening the street to thru traffic not only to Jubilee but to other areas as well, such as Brandon and Morley. This could significantly decrease the amount of traffic speeding down other streets such as Kylemore or Walker. There has to be a place traffic can go to ease the burden on the surrounding area. It almost appears as though the City's traffic engineers just don't get the fact that when you impact one street you impact the surrounding area. The traffic has to flow somewhere. Another bone of contention is the height of the buildings. Even though Lexington Development assures people there won't be shadows, for some it is a matter of the view for others they just don't want the monstrosity of a large building in their community as they feel it would detract from the dynamics of their neighbourhood. For some it's just a matter they love to watch the sunset. A shout out and pat on the back to Shane Cooper of Dillon Consulting who truly did a great job on reassuring the community that their sewers weren't going to all of a sudden back up due to the influx of 1800 new residents and guests. Frankly after all the open houses I've attended I can say he was one of the more outstanding consultants with which I've had dealings. After these meetings, the community still has the right to stand up and have their say. Remember folks there are still hoops the development corporation has to jump through and you have the right and power to be there to present your voice and your views. I would encourage you to stay with the process be it pro or con, let your Councillor and City Hall know how you feel by attending these committee meetings and have your say.
" increased time, cost and emissions related to detours was frustrating. " " The closures have made traffic in the neighbourhood worse." " diverted traffic (drove) down adjacent streets, back lanes and into areas that were less appropriate for cars"
" the majority of bike traffic originates outside the project area." " safety is a real concern (including a)lack of proper signage"
" Many residents and stakeholders were unhappy with the process and generally feel improvements to the area aren’t benefiting them." Does this sound like it is about the chaotic Assiniboine Bike Lane? These conclusions are from an unpublicized city report about the model for Assiniboine. The Argue Street bikeway in Lord Roberts (west of South Osborne Street), which was instigated in 2008 under area Councillor Jenny Gerbasi, has been found by city researchers to be an utter disaster. We were directed to this link by a listener, who wondered why the city did not trumpet this addition to their Active Transportation page with a press release (Good question). Yet despite this assertion, the City of Winnipeg managed to duplicate the failure of the Argue St. process and ignored basic methodology like direct mail, door-knocking, or holding an open house in the affected neighborhood. THE CITY CLAIMED THEY HAD LEARNED FROM THE ARGUE STREET EXPERIENCE BEFORE WORK ON ASSINIBOINE EVEN STARTED, THEN SCREWED UP THE SAME WAY ALL OVER AGAIN. Councillor Gerbasi has pleaded for support, insisting that these problems can be fixed after the fact. As we see, it has taken 2 years to deal with the complaints of Lord Roberts stakeholders. And lo and behold, what is the first "way to improve Argue Street"? 1. In order to make any changes to the closure between Berwick and Walker, the City will need to begin the process to legally re-open Argue to vehicle traffic. We shall see if the city even responds in tomorrow's court hearing to the complaint of the stakeholders that the city failed to take the legal steps to alter Assiniboine traffic that they allegedly took to close Argue, that now must be reversed. The cost of to fix the Lord Roberts neighborhood, which would include the survey and report, legal process to re-open the street, "temporary measures that will accommodate vehicles and provide traffic calming on Argue" are unknown, but sure to be a FRACTION of the cost to fix the mess caused by Gerbasi's pet project downtown on Assiniboine. She knew what went wrong on Argue, and did nothing to stop the same mistakes on Assiniboine. She seems to believe it is appropriate to spend public monies on half-baked schemes to benefit the bike lobby, and then spend more tax dollars after the fact to remedy the consequences of her decisions on her ward. She seems to forget she is not running unapposed on October 27th and voters in Fort Rouge have a choice. Blogger Graham Hnatiuk, whose attempt in August to alert the city auditor of the bungling and waste of the Active Transportation project on Assiniboine was intercepted by 311 officials and diverted to the bureaucrat responsible, has transcribed last Friday's interview on CJOB with Councillor Jenny Gerbasi. What follows is a brief excerpt of his comments. Readers and listeners who are concerned with the state of accountability, transparency and democracy heading into the October 27th civic election, should share his analysis with anyone who says it isn't important for them to vote and have a voice in the way Winnipeg is now being run. Gerbasi twists information at the end of the interview, stating that the Mayor and all of council supported it unanimously. This is blatantly, completely false. Gerbasi should be downright ashamed of herself to twist what they actually approved, to defend her terrible decision making, that only eight residents thus far by my count, support. What did they actually approve? Come on, Gerbasi. They approved the City's third of funding. This is like Disraeli. They approved the funding, and had nothing to do with the plans. The Mayor, as well as councillor Jeff Browaty, on public record during the November 2009 council meeting, both stated their concern over lack of proper consultation. Gerbasi proceeded to take a cheap, unprovoked and baseless shot at the Great Canadian Talk Show, and brushed off concerns about consultation. Well Gerbasi? 11 months later and we know for a fact consultation did not happen. At least, not with any residents or area businesses. Concerns were brought to your attention a year ago, yet you did absolutely nothing to act on them. ... she is in favour of this bike path and thinks it is an improvement for the citizens of Winnipeg. I don't know what kind of improvement that is. Adding over 400 cars per hour to existing gridlock, tripling taxi cab times, revoking bus service for seniors, blocking off access, and making the entire place unnavigable. Making the air unbreatheable...."
- and at 4.40 PM, an interview with Mynarski candidate Jenny Motkaluk. “It is with many fond memories of dedicated public service, in which today I am announcing I will not be running in the upcoming civic election. I have had the tremendous privilege of representing the citizens of Winnipeg and Mynarski for over 30 years and have been proud to work on their priorities. I wish to express my sincerest thanks to all my friends, colleagues, and family who have offered me such strong support over last few months during my illness. I want to express how difficult a decision it was for me to vacate the position I have held for so long , but it is time that I put my health and family ahead of politics and enjoy time with my loved ones, especially my wife Judy, who has always been very supportive of my choices. I have to express my gratitude to Chris Hurley who has served not only as an exemplary Executive Assistant to me for many years, but has also worked tirelessly to serve the citizens of Mynarski as well. Suddenly, after being hidden in plain sight from the mainstream media for weeks, the fiasco of the Assiniboine Avenue bike lane (and other Active Transportation routes) became "news" to city newsrooms. 4) the dangers to pedestrians caused by cyclists using sidewalks and frustrated drivers careening about like mice trapped in a maze. Since June of 2009, the corporate newsrooms, feeding on press release-driven "green is good/Hike it Bike it Like it/use it or lose it" catch-phrases, have followed the lead of city spokespeople and the bike lobby to ignore the legitimate questions about the process and negative effects of the plans in favour of a zombie march to the day when Mayor Katz and city councillors happily provide them with ribbon-cutting photo ops. The optics of drivers waiting for 28 minutes on Broadway, or of seniors trying to vault 8-inch curbs with their walkers, escaped their "professional" reporting. The alternative media, long derided as being 'untrained' and 'without standards' and being 'unaccountable', somehow managed to overcome the handicap of being "lesser media" to forcing the story onto the public agenda and into their newscasts - CBC lead story - and front pages. Suddenly, the quality of public consultation by the city is of interest to the mainstream media. Yesterday, hundreds of readers including the Free Press, CTV, even contractors Stantec Consulting, all flocked to this blog in a desperate search for information on "bikeway lawsuit", "Kevin Nixon" and even the long forgotten( and suddenly departed during the Disraeli bridge uproar) former chief spinner "Ed Shiller". Today, they are clicking furiously through this brilliant compilation of posts and stories about the Assiniboine project by Graham Hnatiuk, whose attempt this summer to alert the city auditor to the failure of the consultants to fulfill the terms of their contract and identify and engage key stakeholders was illegally diverted by 311 to tip off city officials the temperature was rising. People, this issue has been a festering sore that has been ignored for far too long. For months now, the Alternative Media has been covering the back-room shenanigans of this Bike Path on Assiniboine, and many others (Hello Sherbrook Avenue and Berry Street) and the impact that it will have not only area residents, but to the city as a whole. This Bike Path fiasco, and it is a fiasco, has been ignored for far too long. The people pushing these projects (and city councilors) knew that there would be enourmous push back so they did as little as they could to promote these projects to the public. Those of you who are stating that there was plenty of public consultion may actually want to look into this a bit further. Many City Councilors have gone on record stating that the Consultation Process for Winnipeg is flawed and does not work the way that is supposed to! Furthermore, when the public IS involved, what is actually presented to them, and what the public chooses as the best option is ignored! You have to look no further than the Disraeli Bridge/Bike Bridge project for more information on that! Public Consultation? Talk to the owner of RC Eliminator whose business was almost expropriated for this project just after he setup shop there!! Meanwhile, some of the on the record comments in that FP story, and Catherine Mitchell's op-ed piece provide even more ammunition for the lawsuit filed by the South Broadway Stakeholders.
" Council incumbent John Orlikow admits the city didn't do enough to engage residents. Letters were hand-delivered to those living on the corridors, he said, and the city held two open houses. But they only drew 10 or 20 people, he said, and a later mail-out to 15,000 residents doesn't seem to have been widely read. "It's our fault," he said. "It's the city's responsibility to find ways to properly engage the community." "St. Boniface Coun. Dan Vandal rues the very mention of bump outs, which expand curbs a couple of metres into a street, intentionally slowing motorists way down. In 2001, he had the curbs on Lyndale Drive bumped out, hoping to push speedsters to busier arteries. Residents and motorists revolted and they were gone -- all the bumps ironed out - in a year. (Coun.) Gerbasi does concede ... this phase of the cycling corridors construction was done hastily, which left some neighbourhoods short on consultation. All three of the River Heights-Fort Rouge open houses, for example, were held in Fort Rouge." I did call Coun. Gerbasi to complain today and have called in the past. To date, I have received no reply. I brought this curb to the attention of my property manager as well, and they are apparently looking into it as the garbage and recycling was not collected yesterday as scheduled. I wandered down to Assiniboine to check the curb problems, new curbs approximately 8 inches in height for some areas, somewhat less in other areas have been now been laid in front of driveways. Maple Leaf Construction has added gravel so vehicles can get over the steep grade without damage to anyone trying to get over them. The barricades in front of the driveways for these curbs should be removed within the next day as crews are waiting for the cement to dry, the cement takes about 24 hours to dry enough to be used. I was told by one construction worker that asphalt will be laid to bring the grade of the street up high enough so vehicles can pass over the curbs without causing damage which will make them look more like speed bumps than curbs. As I was looking at these curbs a resident approached me, we ended up chatting. This resident manages an apartment building on the south side of Assiniboine, she is mightily annoyed by the work being done by the City on this bike and still doesn't understand why it is necessary. She also informed me she had never received any notification and in fact had not even seen the letter sent out as of July 23 by Bill Woroby. This lady told me that Saturday and Sunday for the events happening on Broadway (ie Cyclovia) the traffic in the area was a complete "nightmare". She wouldn't even go out because there was no way she could even get onto Assiniboine from her lot. She ended just staying home. Her husband is an engineer who has been shaking his head asking "what are these people thinking"? Her husband has also wondered who the traffic engineer was that would allow this disaster to take place and actually wondered if an engineer had any hand in the planning of these changes. I did watch a school bus attempt to make the turn from Kennedy onto Assiniboine, the bus had to run over the curb in order to make that turn. Some residents have told me that on Sunday when Ciclovia was happening they'd overheard some cyclists say that they "wanted Broadway closed down more often". Another resident of the area had informed me that the person who was putting up the letters at the end of July, when asked what this was about said "I don't know I was just told to put these up". This is the level of consultation the City used to tell people of the changes to their neighbourhood, their homes and businesses. We were told that if I remember correctly only 9 parking spots would be lost. I can tell you it's going to be a great deal more than 9 spots. While approximately 26 parking spots have been added to the east side of Kennedy, it still will not be enough and concerns have been raised as to where the residents visitors are going to be able to park. Another concern, which we've already mentioned is how are the moving trucks going to be able to get in to the area. Some of the moving trucks are tractor/trailer units. Those vehicles will no longer be able to get into the area and even if they did there is literally NO place to put them except the bike lanes. Large trucks such as 3,5 and 10 ton trucks will not be able to access the small lots behind some of these buildings, assuming all the buildings have lots which not all do. They would have to be backed in, then park in the driveway as there is no possible way they can negotiate the turns into the lots. Which again will cause all kinds of problems if anyone wants to leave the lot. People will be stuck until the truck moves. But then the City engineers likely didn't think of that issue. Seems they didn't think of a lot of things. Problems still continue and as each day goes by the people most affected are frustrated and angry. There is hope by some of them that an injunction can be put into place and maybe one day their lives will go back to being somewhat normal. Right now, that isn't happening. and have no hand in the planning or implementation of these changes, these residents wanted that made abundantly clear. Today at 4 PM, more about bike lane lunacy with noted financial analyst Andrew Allentuck, and our special guest Bruce Clark will be in-studio to preview his October 2nd show at the Burton Cummings Theatre when he opens for renowned comedian Norm MacDonald ! For over two weeks, the City of Winnipeg has been causing chaos on streets and sidewalks after re-directing traffic off of Assiniboine Avenue to begin building a bike lane. Despite warnings from area residents and businesses that they had never gotten proper notices or maps that clearly explained the plan so they could provide feedback, and that emergency vehicles could not possibly navigate the new-found gridlock, ONLY deaf ears at city hall and blank stares from the mainstream media greeted all complainants. The Great Canadian Talk Show exposed the bullying of the city and the desperate conditions faced by South Broadway stakeholders. * and polluted air from the idling, waiting vehicles wafting through apartment windows. Now a courtroom will hear the pleas of those affected for proper consultation and answer the question if the bike lane is even legal in the first place. Quite simply, 6 plaintiffs have filed a statement of claim against the city and the city was served late this afternoon. The plaintiffs include 10 Donald Street which owns that building, Unicity Taxi, the owners of 33 Hargrave, Dubrovnik Restaurant, Giovanni Geremia, Architect and Avendi Vending. Fundamentally, our position is that what the city is doing with respect to Assiniboine, Hargrave and neighbouring streets requires a bylaw to be passed which the city did not do. Accordingly it is our position that they are without jurisdiction or authority to undertake these works, and we have asked the court to prohibit them from continuing the construction that has been wrongfully undertaken and to return the streets to their condition before the construction began. We also filed a motion requesting the court to expedite a hearing on a motion to prohibit them from continuing construction and to reverse what they have done. We have filed material with the court which lays out concerns with respect to the improper process that has been followed, the significant concerns with respect to the health and safety of citizens related to the impeding of reasonable access for emergency vehicles, the fact that access and egress to many locations in the neighborhood have been unreasonably reduced, that traffic has been gridlocked within the neighborhood and onto Broadway, and the complete lack of consultation related to this ill thought out plan that is hurting the citizens who work and live in this area, as well as those who travel to or through it. However, these are the consequences of their actions. The core of our case is that they have no authority to do what they are doing. The claim also seeks damages. Today it took me about 30 minutes to get from Great West Life to my office. Even at rush hour (as today) this used to be a five minute trip. Pilloried by criticism about the murky Asper Stadium agreement, the Disraeli Freeway debacle, and ongoing controversies about the lack of genuine public consultations on Active Transportation stimulus spending projects that has resulted in downtown gridlock and hard questions of city councillors (and did someone mention the Parking Authority? )Glen Laubenstein is returning to a former employer, in Alberta, right after the October 27th civic election. Here is the press release from the Regional Municipality of Wood Buffalo, Alberta, followed by the optimistic statements he made to CBC upon being hired to run Winnipeg City Hall 2 1/2 years ago. (Fort McMurray, AB – September 14, 2010) – The search to fill the Municipality's top administrative position has concluded with Council appointing Glen Laubenstein as the new Chief Administrative Officer (CAO). Laubenstein brings a wealth of expertise to our region including over 30 years of municipal experience. He will be joining us from his position as the Chief Administrative Officer for the City of Winnipeg. Prior to that, he worked as the Chief Administrative Officer for the City of Kingston, Ontario, and served eight years as City Manager for the City of Brandon, Manitoba. Laubenstein’s distinguished career also includes experience in managing the Regional Municipality of Wood Buffalo at the time of our amalgamation, as well as serving as municipal treasurer and audit accountant with the Province of British Columbia. He is eager to get back to Wood Buffalo and help to lead our future growth. Following the resignation of former CAO, Rodney Burkard, in March the Municipality was led by Interim CAO, Kelly Kloss. Kloss was appointed by Council to ensure sustainability within the organization while an executive recruiting firm conducted a nation wide search to fill the position permanently. Municipality’s current Senior Leadership Team. The appointment of Laubenstein as the new CAO builds on that initiative. Laubenstein will be joining the Municipality in mid November. Until that time Kelly Kloss will continue to service as the Interim CAO. Winnipeg is poised to do great things, Glen Laubenstein said Monday, as officials announced he would become the city's new top bureaucrat. Laubenstein, currently the chief administrative officer of Kingston, Ont., will become the new CAO for the City of Winnipeg, Mayor Sam Katz announced Monday. Laubenstein beat out two local candidates for the job: Alex Robinson, who has been interim CAO for the past six months, and city clerk Richard Kachur. The position became vacant in 2007, when Annitta Stenning abruptly resigned after four years as the city's top civil servant. "Winnipeg is a city progressively moving in the right direction and I am excited to play a role in building on this momentum," Laubenstein said Monday. Laubenstein said most cities are struggling with a shortage of money to repair aging infrastructure — everything from transit to roads — and those that are "nimble" will have the advantage. "To be blunt, we don't have the taxing authorities that other cities in the U.S. have, but I believe it's only a matter of time before there is a real renaissance in the way local government operates," he said Monday. "The cities that are poised and past the rhetoric and ready to go with the action plans are the ones that will succeed when that breakthrough happens, and I believe it already has started." Laubenstein also plans to take a more collaborative approach to city hall, he said, as opposed to having departments operate in "silos," as often happens with police departments. "Police departments, to be effective in the issues that they deal with, probably don't have all the money they'd like to have to do community policing," he said. "But there's a community services department in every city — so why do the police department and the community services department not collaborate better on making neighbourhoods better? Because I think most of us know one of the best ways to deal with crime is to deal with poverty." Long-term planning, in which departments come up with common goals and share resources, is the solution, he said. The move is a homecoming of sorts for Laubenstein, who was the city manager in Brandon, Man., for eight years before moving to Kingston. He has also managed the municipalities of Wood Buffalo, Alta., and Richmond, B.C. Winnipeg's executive policy committee and city council must approve the selection committee's decision, which is expected to happen at meetings later this week. Laubenstein is expected to take over the position in April. discussions with those directly affected. Because the consultation process was badly flawed, those who live and work in this neighbourhood were taken by complete surprise. Please review the following supporting information. three lanes of traffic on Assiniboine to two lanes. Changes will see portions of Assiniboine Avenue changed to one way traffic in many directions. Assiniboine Avenue traffic will be diverted to Broadway Avenue. A letter dated July 13, 2010, announcing the start of construction, was delivered to mailboxes and taped to doors of large apartment buildings and businesses in the area. When these letters were received varies from place to place and to date there are residents, building and business owners who have not seen the letter and did not know the nature of the work to take place on Assiniboine Avenue until the work started. Even after work started they thought that these were street works and that the traffic diversions were only to be temporary ones, since signage used throughout the construction zone shows directions to be “temporary”. Page 2 of 8 investigated they found the remnants of the tape on the door but no letter. In the case of the building at 10 Donald (Campbell Marr LLP), the letter was taped to the door of the building off of the Donald Street bridge, a door that the firm does not use. It was only when one of the employees in the building went out to water some flower pots that she found the letter. 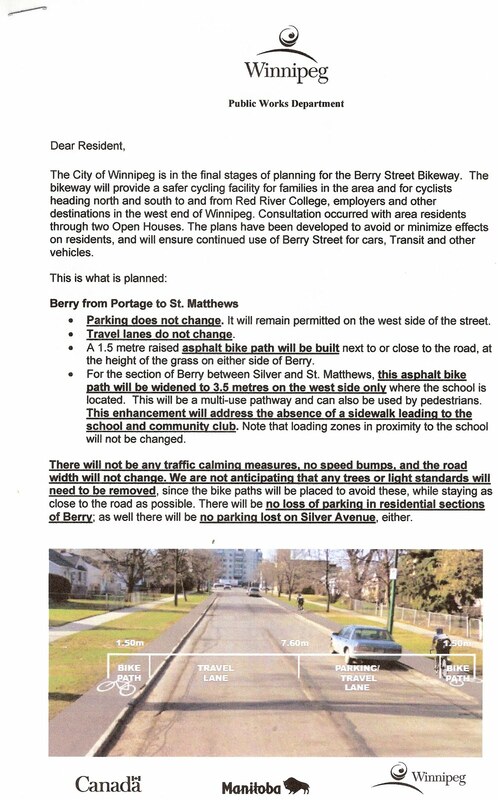 The plan included in the letter of July 13, 2010 calls for Assiniboine Avenue to become a one way street between Navy and Hargrave among many other changes to the avenue. This change will have an adverse affect on all residents, business owners, and building owners south of Hargrave place, west of the Donald Street bridge and East of Hargrave Street. This includes a fleet of 250 or so taxi cabs and over 550 residents along with at least 9 businesses. These residents, businesses and buildings will now be prevented from going east on Assiniboine avenue and their access to the south west part of the city has been cut off. Access to that part of the City now can only be by way of a very busy Broadway adding considerable distance and time to travel to those destinations. The retricted access to this area can only lead to congestion and devalued properties and businesses. found, he contacted the City and set up a meeting to see if that portion of Assiniboine Avenue could be kept as a two-way street all the way to Hargrave Street. He, and one of his partners, met with the project manager, Bill Woroby, Cindy Desjardine, City traffic engineer, Michael Jack, City solicitor, Ruth Marr of Marr Consulting and Michael Bradley of Stantec Engineering. accommodate two lanes of traffic and the bicycle boulevard. After suggesting many possibilities on how this narrowing of the avenue could be addressed so that it would be able to accommodated the cycle boulevard and the two lanes of traffic he was told that changes were not possible at this stage. Mr. Mackenzie asures me that no one advised him that Handi-Transit was an issue in respect of the stretch of Assiniboine from Navy Way to Hargrave Street. (This is relevant to discussions below). Mr. Mackenzie contacted Councillor Swandel (Chair of Standing Policy Committee on Downtown Development) to ask for a meeting and after Councillor Swandel met with the City staff his reply to Mr. Mackenzie was … “I went over this thing every which way and I think the current proposal is the best case scenario for all concerned”. Mr. Mackenzie had requested that he and myself be present at the meeting to give our viewpoint and suggestions. The request was denied. All this took place before construction started. I had offered my services as a design professional to work with staff on finding a solution but the offer was not considered. I contacted Concillor Gerbasi to bring this situation to her attentions and in her email of August 20 she said that she had asked the project managers to provide a detailed explanation “ … in writing of the reasoning behind the one way changed under the bridge to be provided to those concerned After we were denied being able to meet and offer solutions for how the narrow street could accommodated both the cycle boulevard and a two way traffic I began to research how this plan came about. At the meeting of the City Centre Community Committee of September 8, 2009 a report prepared by City administration was received and adopted by the Committee. The report was called “Development of the Assiniboine Bike Boulevard”. According to the report, the City staff claimed that public consultations were carried out and that there were a number of public information letters sent out with the last one going out on August 10, 2009. Therefore, one would assume that by the time the report was prepared all public consultation would have been carried out and the final design prepared for submission and adoption at the September 8, 2009 meeting. Appendix No. 2 in the report clearly stated that Assiniboine Avenue would remain a two way street between Main Street and Hargrave Street. This is the change we were looking to make to the plan distributed in the letter dated July 13, 2010 but were told that it could not be changed. stated that Assiniboine Avenue would remain a two way street between Main Street and Hargrave Street. neighbourhood who are most directly affected by this plan are not on the list. On a radio interview (noted later in this letter) Mr. Nixon stated that they had sent out 32,000 letters yet a public meeting at the Norwood Hotel resulted, from what I have heard, in an attendance of fewer than 100 people. Most of them would most likely have been from the cycling community. Neither I, nor any of the many residents or businesses I have discussed this with, received any information until the July 13, 2010 letter was distributed. Along with the fact that there never was any meaningful public consultation with the residents, business owners, and building owners, I was taken by surprise to find that that even though the Committee adopted a plan that had Assiniboine Avenue slated to be a two way street all the way to Hargrave, the plan in the July 13, 2010 letter had changed that portion of Assiniboine Avenue to be a one way west bound street. How Did This Change Come About And How Was It Justified. Those of us between the bridge and Hargrave could have lived with the changes proposed for Assiniboine Avenue that were adopted at the September 8, 2009 City Centre Meeting. However, I cannot speak for all those located west of Hargrave Street but can guess that they are also greatly impacted. There was no communication with the neighbourhood between the City Centre Committee meeting and the July 13, 2010 letter. City Centre Community Committee Letter September 7, 2010 Page 4 of 8 When I discovered this, I wrote to Councillor Gerbasi (email of August 30) to let her know that I had not heard from Mr. Woroby and to inform her of the above. In the email I requested It appears that the changes were made arbitrarily by City staff after the September 8, 2009 City Centre meeting without any public notice at all. In that same letter to Concillor Gerbasi I asked for the project to be stopped and that a meaningful consultation process be initiated. Construction was just getting underway at the time and this could easily have been done. That same day I received a call from Mr. Woroby which I was not able to return until the next day (August 31st). I specifically asked Mr. Woroby about the process in making changes once the Committee adopted the report last September and was told that that report was only submitted for information and that they could make whatever changes they wanted in finalizing plans. I find this astonishing. I also asked Mr. Woroby why the changes were made to Assiniboine between the bridge and Hargrave and he now told me (contrary to the advice Mr. Mackenzie received) that it had something to do with having heard from Handi-Transit in the interim and they required that their bus doors had to be on the north side of the street to load and unload passengers. In order for this to happen they would have to travel in an westerly direction. I found it odd that they would have not consulted Handi-Transit before the plan was finalized for the report submitted to City Centre for the September 2009 meeting. Mr. Woroby’s answer now contradicted the reason they had given to Mr. Mackenzie when he first met with them (that the road was too narrow under the bridge). I could not make any sense of this since there are no buildings on this part of Assinboine that do not have a place for a handi-transit vehicle to drop off or pick up their passengers. Mr. Nixon used the word “tweaked” to describe a major change that is affecting a large number of people in the area who have been there for many, many years. I myself have been at that location for over 20 years. given by City staff to Mr. Mackenzie earlier in the process (street too narrow by 2 feet). I have in my possession confirmation from the City of Winnipeg that the address on Assiniboine that Handi- Transit was concerned about is 375 Assiniboine Avenue. This is located west of Hargrave Street. 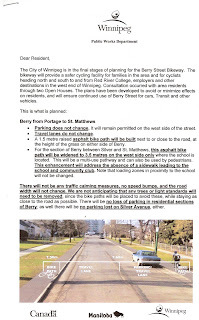 That portion of Assiniboine was to be a one way street in the plan submitted for adoption by the City City Centre Community Committee Letter September 7, 2010 Page 5 of 8 Centre Community Committee in 2009, and maintaining Assiniboine as a two way street to Hargrave would have impact on the Handi-Transit system. Why was the plan changed? It was not for Handi-Transit as Mr. Nixon and Mr. Woroby have stated. The question still remains. Through Campbell Marr LLP, the group of businesses and building owners in this area that are directly affected wrote to Mr. Laubenstein on August 31 to also ask for a stop to the project until meaningful consultations could take place. That letter was shuffled off to the Director of Public Works who was on holidays at that time. claim by the City that an extensive public consultation process was undertaken. 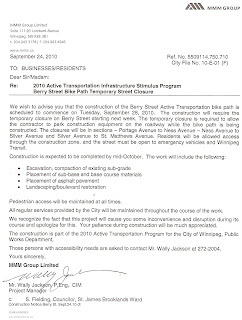 “Cycle Projects Get Rolling”, (August 30, 2010) from where the following is quoted: Many residents only became aware of the work after construction started, despite a series of mailouts sent out early this year, River Heights-Fort Garry Coun. John Orlikow said. people aren't thinking about construction, Nixon said. nightmare. The public lane beside my building is often blocked by moving vans. When emergency vehicles respond to emergencies in this area they will also block the narrow lanes and result in total cut off to the residences and businesses. Were any of these addressed? regular basis, and emergency vehicles were blocking the only lane we had to access our properties. Page 6 of 8 with shock. direction. I also had the opportunity of listening to a recording of an interview that Mr. Nixon did on 92.9 KICK FM radio earlier this year. As a design professional it was painful to listen to, hearing how “loosy goosy” the rational and base behind this massive cycle path infrastructure has been. -We were learning on the fly. -32,000 letters went out yet fewer that 100 showed up at a public workshop. struggling with the rest of the 35 projects –how best to get people out. -We do not want to do anything to screw thing up in any neighbourhood. -Would have been a good idea if a traffic person were sitting on our committee. citizens until a plan was developed. by the effectiveness of that method. goes hand in hand with a bike boulevard. -One week’s notice for public meetings. opposed to. (what about the citizens)………. certain percentage of residents in the area before changes to traffic patterns are made? consultation attempts failed and it now appears that decisions were made without a solid foundation or consensus by those that will be most affected. Only a few examples are offered below. The diverse make-up of our neighborhood also includes a vulnerable segment of the population. This group of people on any given day can require immediate responses from The Winnipeg Police, Fire and Ambulance Services. Any delays could mean the difference between life and death. Our long time neighbours (who have never been consulted about this until the July 23rd letter) have also advised an increase in the number of individuals parking on their premises illegally. When the illegal parkers have been asked to leave, threatening confrontations have followed leaving our neighbors with no recourse but to call 911. People claim they are parking there as they have nowhere else in the neighbourhood to park. Additional parking provided by this plan on Kennedy, which is many blocks away, will not help this group. Taxis, delivery/moving trucks and service providers are part of everyday life on this street and how will they conduct their business with these changes? All businesses and residents here have the same concern but in the case of vulnerable people, we must ensure response times from emergency service providers remain unchanged. Yet, emergency vehicles, including fire, ambulance and police, will be forced to go longer indirect distances, and/or the wrong way down even narrower one way streets, and access to the St Boniface hospital will be worse. Who on the city will stand up and take responsibility when the first person suffers or dies because of the problems created by this project? ramifications that it is apparent the planners never heard about, because they chose not to directly approach any of the affected operations, businesses or apartment blocks in the area. As a result, they never addressed these and many other issues. Narrowed roadways, loss of 2 way traffic and reduction of parking spaces and loading zones impact the ability of taxi services to pick up and drop off passengers in this densely populated area. Similarly, vehicles dropping off or picking up friends in the area have new problems, never before seen. Unicity Taxi, with 250 taxis in their fleet, find restricted access to large parts of the city harming their operations. Other buildings will be in a similar dilemma. As well, planners have not taken into account the realities of moving vans that from time to time block access down a lane or street when residents are moving, or which, because of their size and the reality of the operations in the area of garbage trucks, buses, delivery vehicles, emergency vehicles etc, will completely block access to traffic at any given time on any street. Removing alternate routes from residents and businesses, and those serving them, will create traffic chaos and complete gridlock on a regular and ongoing basis. We who live and work in the area are familiar with how it functions, and has done so successfully, with relatively modest difficulties for many decades. Unfortunately the planners have clearly shown that they did not and do not understand this neighborhood and did the least possible to engage its citizens in a fair and meaningful process. The damage that will be otherwise caused can be avoided if officials will be prepared to listen now. result from this unless it is stopped and reversed. Thank you for sharing your concerns. I would like to provide some clarification in regards to the request to put an immediate stop to the construction of the Assiniboine Bikeway. The authority to stop a project such as this lies NOT with the City Centre Community Committee but with the Standing Policy Committee on Public Works, Chaired by Councillor O’Shaughnessy. Furthermore, the project is funded under the Federal Stimulus program which means the project must be completed this construction season. Delaying it would result in a loss of the funding. The primary issue with the bikeway appears to be regarding one-way/directional changes. These matters can be reviewed and adjusted if in fact there are serious problems once the project is implemented. Secondly, I have been advised that the CAO, Glen Laubenstein, will be responding in writing to Mr Doug Mackenzie in regards to the concerns raised by your group.